Our second article in the examination of the unique business model of retail sales, as the “motorcycle boom” of the late sixties and early seventies reached the United States. This was a time when hardware stores, used car dealerships, individual racers – and, nearly anyone with a few hundred dollars and some extra space – could become a dealer. If you haven’t read the first installment, you can find it here. Hamilton ordered a 125cc Maico in 1969, racing in both the 125 and open classes in scrambles and “scrambles/TT” events. He was very successful as a racer, encouraged by the additional income (“I had to make money. I was driving to Ohio because they’d pay $50 to win in dirt track.”). Hamilton was awarded the #1 Plate (meaning the recipient had accumulated the maximum number of points in the past year) for six years in a row, in his home region, the western-Pennsylvania District-5 region. 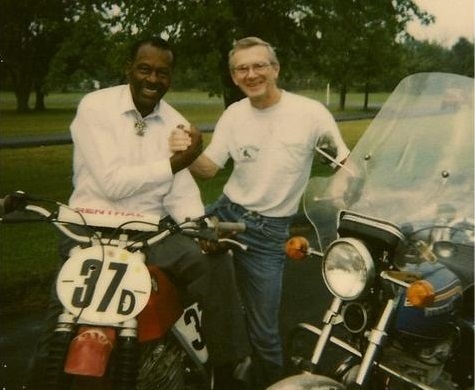 He never raced with the #1 plate on his bike, however, electing to stay with his original #37 racing number—and perhaps to bring undue attention to himself, which might not be for the best, as he learned in his snowmobile racing. Racing on weekends and back in the shop during the week, Hamilton achieved the dream of many motorcyclists: making a living, doing the thing he loved. His racing career spanned the years from 1964 to 1980. American scrambles racing was also known as “TT” or “scrambles/TT,” and generally as “dirt track”—though the term dirt track also might imply other various oval-track events. Hamilton notes: “’TT’ and ‘scrambles’ were about the same thing: different districts would call the same type of course different things. They had to have the straightaway and the left and right turns. A jump wasn’t mandatory, but most [tracks] had it. This would be a high-speed, gradual, natural-terrain kind of jump. You didn’t go really high—about three or four feet—but you went really long. You’d usually hit this jump in third or fourth gear; it was really fun.” This type of racing, very dependent upon sliding technique, incorporating short heats over a smooth track, and requiring only moderate physical exertion, didn’t put the Americans in strong physical condition for motocross. When the more physically demanding sport of motocross and its European stars arrived in America about 1970, Americans riders would be on a steep conditioning and learning curve. Awed by the little Maico 125’s excellent power output, but unimpressed by its almost complete lack of reliability (especially when hopped-up), Hamilton combined the best features of two manufacturers. He replaced the Maico 125 engine with one from a Yamaha 125, and now had a hybrid combining the best of two worlds; the solid and inexpensive Yamaha engine in the unsurpassed Maico frame; excellent-handling and very reliable! 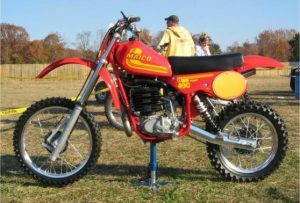 Racing as well in the open class, his other machine—the Maico 400—also served him well, until he obtained one of the very first 440s in the country, from Dennie Moore in 1972. Racing success verified Hamilton’s reputation as an expert mechanic, as well, and his mechanical work was sought out by other racers. 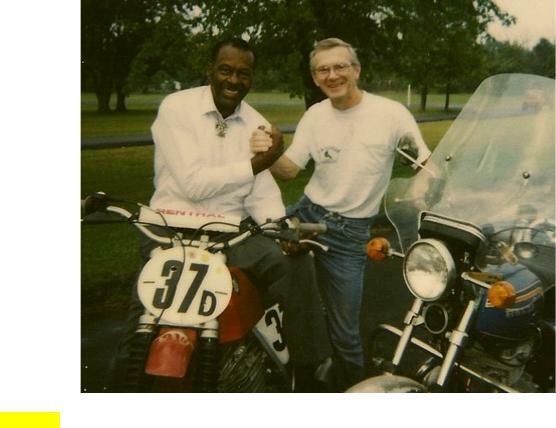 He recalls that in addition to the local riders who he did work for, many other well-known riders frequented H&H Cycle. 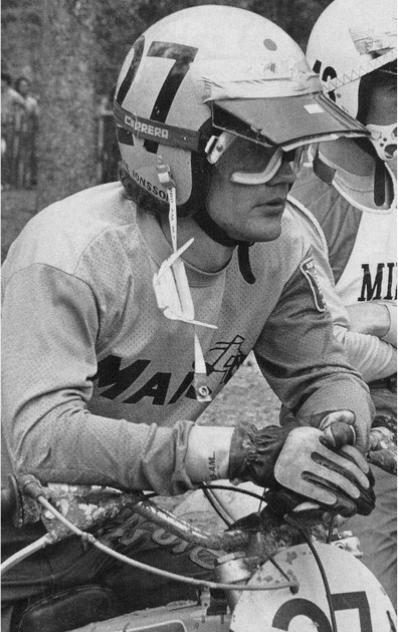 American riders Jimmy Weinert and Gary Chaplin would visit, along with the more famous European Maico team stars like Adolf Weil, Willi Bauer, Gerritt Wolsink, and brothers Ake and Tore Jonsson. Visits by Weil, Bauer, Wolsink, and the Jonssons occurred while these factory racing starts were passing through the area on the InterAm or Trans-AMA series races. Hamilton enjoyed all the international riders, and was particularly fascinated by Ake Jonsson’s professionalism and athleticism. The occasional personality differences, he felt, could have occurred in any culture, and he recalls most of the champion riders as being very unaffected by fame, and being humble and friendly to everyone they met. The European star riders would occasionally eat dinner at the homes of area dealers and racers, an event fondly remembered by the locals. Hamilton got along with them all, although the memory of his occasional disaffection with German attitudes (from the factory) does sometimes arise. As does Dennie Moore, he professes to having experienced a rare but nonetheless real harshness in the German psyche. Hamilton’s biggest praise as a mechanic and tuner was his remarkable understanding of two-stroke engines, from the earliest days of the two-stroke’s rise to popularity, in the 1960s. Maico had, since their inception, utilized two-stroke engines in all their motorcycles, and Germans have long held a reputation for excellence in two-stroke engineering. The pioneering work of German motor company DKW in two-stroke design from the 1920s through the 1950s is particularly notable. For riders in the United States, long used to large four-stroke motorcycle engines like those on Harley’s and Triumphs, the practice of tuning two-stroke engines for racing was still largely a mystery the early and mid-1960s. Two-stroke design had previously been relegated to use in smaller, cheaper motorcycles in the United States and England, and it was not considered “proper” propulsion for a manly, full-sized motorcycle. Even Honda Motor Company founder Hirohito Honda reportedly loathed the noisy, oil-burning two-stroke engines, and refused for decades to have the Honda name attached to one. (The company finally broke tradition and entered the two-stroke market in 1973.) One cause of the rise of the two-strokes was that, following World War II, the rights to build German DKW-designed motorcycles were awarded to the allies as part of war-reparations compensation agreements. In the United States, Harley-Davidson interpreted the DKW design into their lightweight Hummer model, and in England BSA made a similarly low-end variant known as the Bantam. Still, the whining, smoking little bikes did not endear themselves to most Americans, whose open roads embraced the large, heavy four-stroke Harleys, Indians, and by then the bigger-displacement British imports. Further hurting the acceptance of two-strokes was the very limited understanding of their performance; specifically, that of cylinder porting and “expansion chamber” exhaust design. The introduction of high-performance, larger-displacement two-stroke dirt bikes to America and around the world in the mid-1960s was transformative; it was a watershed development and afterwards the scene was forever changed. These motorcycles may have belched blue smoke and their un-muffled exhausts churned out excruciating noise, but they were undeniably powerful and fast. The CZs, Maicos, and Husqvarnas of the era weighed much less than all the then-dominant four-strokes, and put out not only greater, and more usable power. 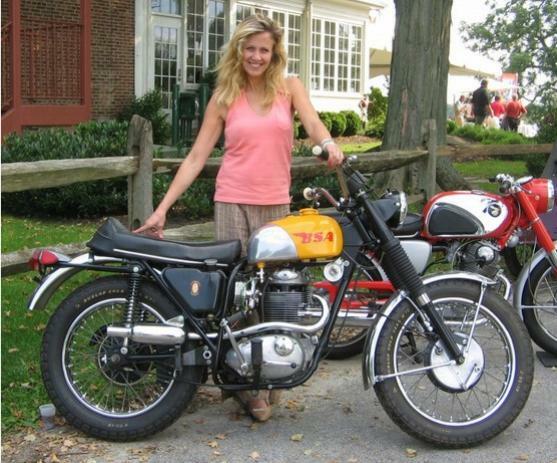 Furthermore, they were simpler and cheaper to build, operate, and repair than the four-strokes. Within just a few years, the large four-stroke singles and twins were completely supplanted by lighter, better-handling, and [at least] equally-powerful, two-strokes. Hamilton embraced two-stroke technology from its early introduction in the form of the small imported motorcycles that he first raced, and progressed into the maintaining and tuning of the larger Maicos. Maico engineers had, years before, absorbed the advancements made by earlier DKW engineers, and understood expansion chamber design—that is, harnessing the exhaust shock wave to help “pull” the next exhaust charge from the cylinder—and were building powerful two-stroke motorcycles since the 1950s. Hamilton tuned both his own motorcycles and those of his customers to the limit of reliability, extracting maximum horsepower and tailoring power output to the rider’s preferences. He was and still is known for his understanding of all the Maico engines, from the “Swiss watch-like” 125, to the big 440s and 501s. Hamilton was also one of very few Maico mechanics or riders who understood the design flaws in the early 250 radial engines. As Hamilton prepared the bikes, Jonsson watched in amazement as riders exceeded 100 mph down the straights, and then flung the motorcycles sideways in extreme, edge-of-control, two-wheel-drifting slides around the corners. “I’m getting this baby ready and we’re putting the sprockets on. And he keeps saying, ‘Oh, my, no . . . crazy Americans!’ But it was funny; we were all having a good time. He practiced, and then he wasn’t going to race, and then he was. Anyway, he decides he’s traveled all this way, so he might as well do it. He got a good start, not too far back; pulls ahead of several riders. But, then he enters the first curve, and he squares it off! Oh, my gosh! We thought the other riders were going to kill him! You know, you have to get in there sideways, but he squares it off! Oh, he hit a couple people, and it was bad. He made a lap, and then just pulled off and parked his bike, and said, “Crazy! Too fast—no good!’ And, that was it. 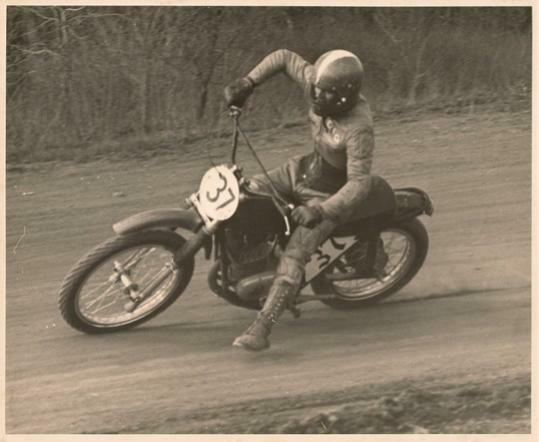 We never talked him into going flat-tracking with us again!” Jonsson may have been the best motocrosser in the world, but in the traditional American venue of flat-track, even he had things to learn. Hamilton’s business model, a small building with a one-man operation, was common in the 1960s and 1970s. In time, the industry did change significantly: less competitive and smaller manufacturers were pushed out, and the stronger surviving companies worked to create more compliant, efficient, uniform, and profitable dealer networks. The first casualties of this reorganization were small dealers. Other than a few businesses dealing with the remaining “boutique” motorcycle brands still in existence, the small Mom and Pop dealership is now mostly gone from the United States landscape. 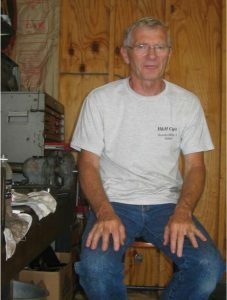 H&H Cycle remains, though no longer a dealer for new motorcycles, concentrating now on parts sales and mechanical work. 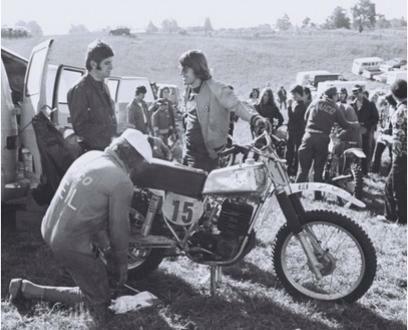 Had Maico remained viable, in the face of both its own missteps and the escalating competition from the Japanese manufacturers, H&H Cycle and other small dealers may have continued selling high-quality European imported motorcycles. 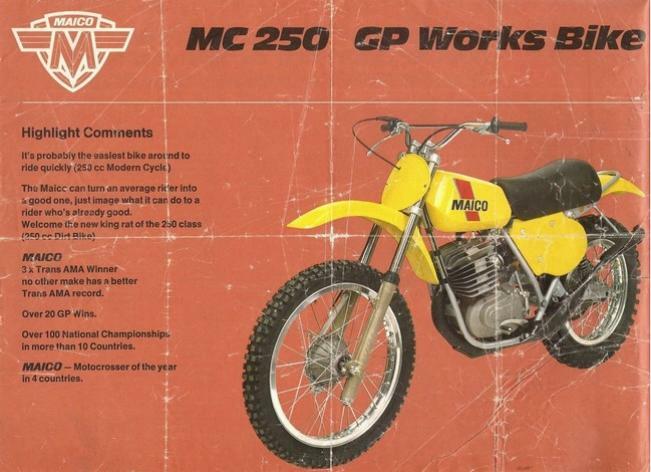 But this was not to be, as the small manufacturers like CZ, Monark, Puch, and Husqvarna—suffering like Maico, from bad assumptions and increased competition—continued to lose market share. The modern era of off-road motorcycles is now one dominated by the Japanese factories, with KTM and Husqvarna surviving as the non-Japanese option. It’s winter, now, in Pennsylvania. The little turtles are firmly in their muddy, dark hibernation, and the ponds are all frozen over. Time for Gig Hamilton to pack the RV and head to Florida, for warmth, fishing, street riding, and a few memories! 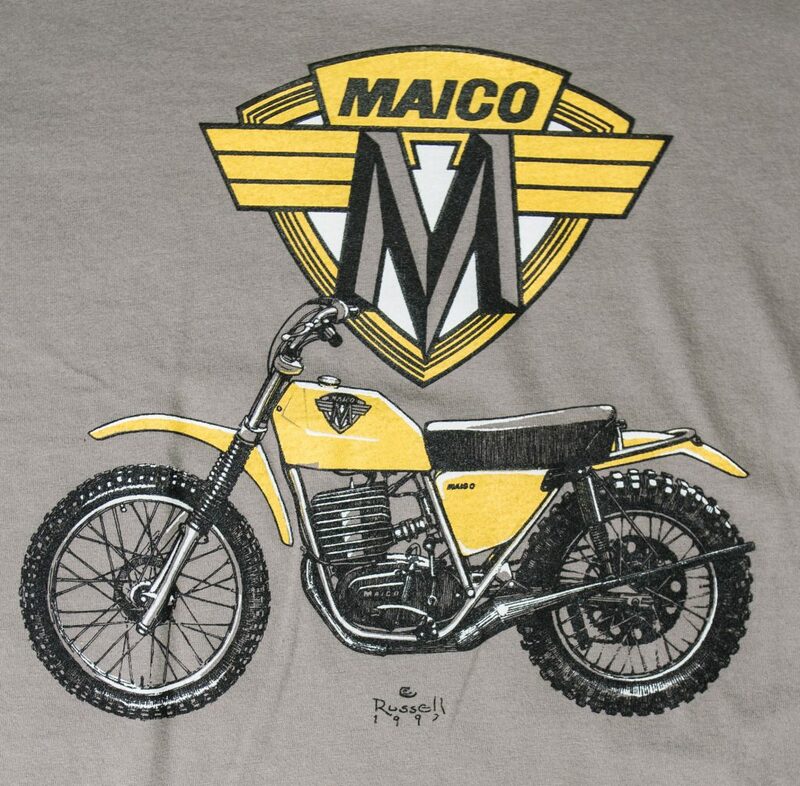 Click HERE to view our hand designed Maico 250 t-shirt in our shopping gallery. We’d love your support! I hope this essay has been enjoyable. We always welcome your suggestions and comments!